This Sunday, at WrestleMania 35 women will compete in the main event for the first time ever. It’s a watershed moment that is long overdue. Indeed, with an overabundance of talent available on the roster, the company couldn’t afford to marginalize women’s wrestlers much longer. This salient decision came at a pivotal time for female athletes. Women all over the world are accomplishing more in sports than ever before. Finally presenting women as equals among their male counterparts is commendable. However, it’s hard to praise WWE when it feels like some things haven’t changed much at all. It’s tough to express this because this is a groundbreaking match, and the women involved deserve this opportunity. Still, it’s a little bittersweet when coupled with the lazy way the company has booked the other women for the last few weeks. Yes, the occasion is a victory for the entire division, as well as all the trailblazer who came before them. But even so, it stings to see Charlotte, Becky Lynch, and Ronda Rousey elevated, while women of color are pushed to the background. That isn’t to say WWE should’ve put another woman in the main event just to fill a quota. But they had the chance to showcase them in the SmackDown Women’s Championship match. Instead, they decided to put both titles up for grabs in a Winner Take All Match. A long-standing criticism of WWE is that they don’t book more than one interesting storyline involving women at the same time. This decision goes a long way to prove those cynics right. It feels regressive and it taints the positive message of the main event announcement. Admittedly, that almost feels harsh, but it’s impossible to reconcile both choices. 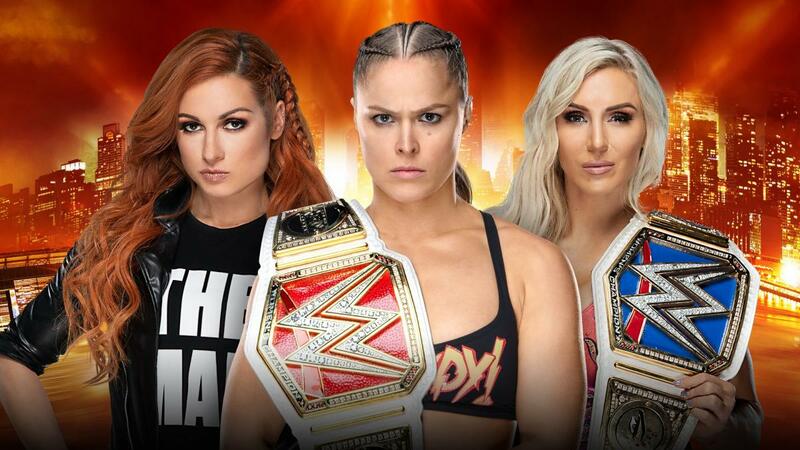 WrestleMania 35 could’ve featured three women’s championships matches for the first time in the event’s history. What a missed opportunity. If the idea is to present female competitors as equals, then they should compete in more than one meaningful match on the card. Furthermore, those positions shouldn’t be allotted to the same women when the roster is more diverse than it has ever been. That leads to the elephant in the room, the curious usage of Asuka. There has been much debate over the Empress of Tomorrow’s first title reign on the main roster. Watching her drop the SmackDown Women’s Championship two weeks before The Showcase of Immortals was emotional. It left fans rightfully questioning why it was necessary to do this seemingly at her expense. On the surface, it seems like WWE did plenty to promote her as a massive star. Asuka won the first women’s Royal Rumble, which granted her the opportunity to challenge Charlotte at WrestleMania last year. She eventually won the title in a match with two of this year’s main event participants. Surprisingly, she beat the hottest women’s wrestler in the company, Becky Lynch, clean in January. That all sounds good until we take a closer look at what it did for her standing with the promotion. It always felt off that on the night of, and the following morning, that the news wasn’t that an Asian woman won the first-ever women’s Royal Rumble. No, everyone was talking about Rousey. Even more, when Asuka finally won the title she had to share that spotlight with Rousey again. It felt very much like she only won because Ronda interfered. Considering those two incidents, we shouldn’t have been that surprised when she was forced to drop the title. That’s the crux of the issue here. The problem isn’t that Asuka can’t possibly recover from this and win the title again. It’s that she has been an afterthought more than once in situations that prop up women who are already in the spotlight. A new feud, and noteworthy match at WrestleMania, would’ve finally granted her a moment that wasn’t tied to Rousey or Charlotte. Despite her list of accolades, she doesn’t feel like as big of a deal because she is always cast aside so one of them can shine. Similarly, she made Becky tap out and in the next few weeks, Lynch received airtime on both Raw and SmackDown. The reigning champion didn’t appear on television at all. Losing the title after weeks of this was the metaphorical cherry on top. That begs the question: how progressive is all of this if women like Asuka are relegated to the kickoff show so the main event will feel bigger? The problem doesn’t stop with her booking either. Why were most of the women of color thrown in a catch-all battle royal, instead of showcased on the main card? It’s just disappointing to see privileged women take an opportunity from women who don’t get big storylines. Moreover, it’s hard to ignore that women of color are the ones who are getting neglected. This isn’t the first time white women have been positioned as the face of women’s empowerment at WWE. A few months ago, Nia Jax criticized WWE on Twitter with the hashtag, #WeHereToo, for failing highlight the achievements of women of color. There was also the criticism among fans about the Evolution poster. What makes this all so insidious is that it’s coupled with accomplishments like the WrestleMania main event so it’s hard to complain about it. Women are getting more favorable treatment with the company. However, WWE can’t be lauded for equality until they make those opportunities more inclusive. What do you think? Drop a comment below with your thoughts on the Winner Take All Match and the WrestleMania Women’s Battle Royal.